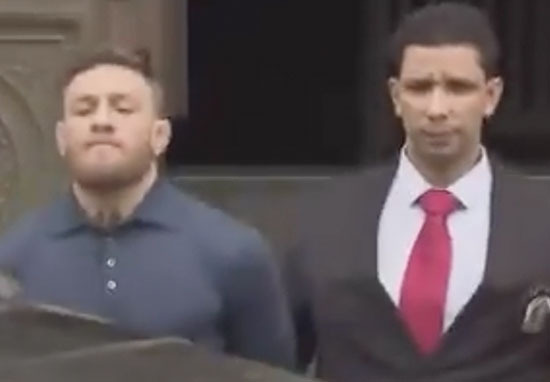 Conor McGregor, perpetual bad-boy of the UFC and the world in general, has been pictured leaving a police station in New York sporting a lovely pair of handcuffs. Switching UFC gloves for a more traditional steel cuff, McGregor was seen being escorted out of the station in Brooklyn, reports TMZ. As I’m sure by now you are all well aware, McGregor was arrested after footage emerged late last night of him launching a dolly at a UFC bus carrying Khabib Nurmagomedov among others. The footage, which has since gone viral, shows McGregor smashing a window which injured numerous people, leading to the arrest of The Notorious, for misdemeanour assault and felony criminal mischief. It is still not totally clear why McGregor acted the way he did. However it isn’t only the cops that are p*ssed with McGregor’s antics. The UFC themselves are really quite annoyed too – with Dana White publicly criticising him. White has revealed he last spoke to McGregor shortly before he turned himself into police following the backstage criminal altercation. Conor and I talked through text yesterday. It was obviously the worst conversation we have ever had, shortly before he turned himself in. I don’t believe he realised what had just happened. It’s not that I don’t think he understood what happened, it’s that he tried to justify it. He said listen I’m sorry about Michael [Chiesa], and I’m sorry about Rose [Namajunas] and whoever else, but this had to be done. What do you make of McGregor’s antics?